All products and services provided by CFI shall coincide with customer requirements and meet the highest quality standards. Each employee is responsible for recommendations leading to improvement of processes involved in their immediate work designation or any other company related processes. CFI is continually looking for ways to improve its quality practices in regards to production, purchasing, delivery, support, testing services, management and engineering processes. Supply customers with products and services of the highest quality. Provide those products and services on time and within budgetary means. Supply the best value and pricing for customers that is available. Facilitate open communication with customers in order to meet the customers’ needs. Provide employees with motivation, involvement in processes, and training that will add to their personal value and ultimately lead to constant quality improvement. 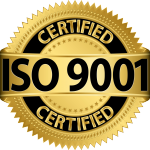 ISO 9001:2008 and to provide the framework to allow accomplishment of our quality objectives and goals.